This is an impassioned look at how society constrains people, and music sets them free. 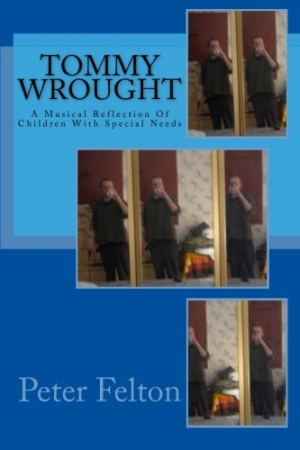 Tommy Wrought: A Musical Reflection Of Children With Special Needs by Peter Felton is about how one man found a sense of identity and comfort through music, and the hope that others can do the same. The author relates his experiences with the painful effects of narrow societal definitions, particularly of common limiting terms like ADD, Bipolar Disorder, and Autism Spectrum. Yet he has also experienced the freedom that comes through music. Through a detailed examination of the rock opera Tommy, written by Pete Townshend of The Who, Felton draws a comparison between the damage and disunity caused by narrow expectations for present and former military, as depicted in the opera, and for children with diverse strengths and needs. Along the way he presents a healthy dose of WWII era history and other U.S. history. The book is organized into chapters that focus on main themes like politics, parenting, bullying, and technology, through which it examines Tommy and the author’s own related experiences. The life and experience of the character Tommy are presented as moving, and the book displays a wide range of knowledge on topics from history to religion to education. The text’s motivations, and its particular focus on Tommy, are largely left unclear until the section called “Tommy Within The Author, His Life and Work” at the end of the book. There, Felton discusses the particular situations that have given him the same challenging thoughts and emotions as Tommy—challenges that were eased through the musical. This personal narrative element is underused in the rest of the book, making it tough to connect to Felton’s thoughts and feelings elsewhere, since they’re so often conveyed in relation to Tommy, and not to the author’s own life. The writing is full of passion and emotion, but that leads to wordiness, overly long sentences, and an often unclear message. There are many descriptions of scenes from Tommy that lack a clear sense of the significance of each for the author or the audience. Footnotes—sometimes side notes about the scene being discussed or historical notes—contribute to the scattered feeling of the book. The book is guided by passion and ideas, but seems to expect its audience to already have devoted the same care and attention to the play at the center. The intended or ideal audience is a bit of a mystery: it could be other students who’ve struggled, other teachers who want to help, or people processing social trauma, such as returning veterans—but all of these groups will find sections of the book that are not relatable to them. The book is a compelling view of Felton’s diligence and compassion as a teacher and a super fan of The Who, making Tommy Wrought an impassioned yet bewildering look at how society constrains and music sets free.